The Digital Research Library of Illinois History Journal™: The Cholera Epidemic of 1832-33 in Illinois. The cholera epidemic of 1832-33 and its impact on one Illinois town. Thirty-eight-year-old Frances Ellis suffered but a few hours before succumbing to the dreaded disease that Jacksonville, Illinois, citizens prayed would spare their small town. The disease was cholera, and before the summer of 1833 was over, about 50 of Mrs. Ellis' friends and neighbors, plus her two young children and a niece, would die. Mrs. Ellis' husband, the Reverend John Ellis, was traveling when his family died and did not find out about their deaths until he returned. Ellis, a Presbyterian minister and missionary, was one of the founders of Illinois College, located in Jacksonville. Mrs. Ellis was one of the leading women in Jacksonville at the time; she was a founder of a local women's social organization and a private school for young women. Mrs. Ellis school grew to become the Jacksonville Female Academy, one of the first schools for the higher education of women west of Ohio. Illinois College Professor Jonathan Baldwin Turner described the deaths of the Ellis family members and the mood of the citizens of Jacksonville in a letter he wrote to his future wife, Rhodolphia Kibbe, in Connecticut, on August 28, 1833. "Mrs. Ellis ... a lady of rare accomplishments, was taken sick one afternoon, and died before six o'clock. She had two little children; one was taken at one o'clock that same night, and died before morning; the other, and a niece, Miss Conn, a beautiful young girl of eighteen, died soon after. Mr. Ellis was away at the time, and when he returned he stopped at the church to attend prayer meeting before going to his home. As he entered the door he heard a friend praying for their 'stricken pastor so suddenly bereft of all his family.' He fell to the floor as if he had been struck by a butcher's ax. Immediately after this, forty-seven families, and as many single persons as could leave, fled." Cholera was just one of the many diseases that pioneers such as the Ellis family had to battle in nineteenth-century America. Cholera, is a severe, epidemic disease spread when people swallow food or drink, usually water, contaminated with bacteria from a cholera patient or carrier. The disease causes profuse vomiting and diarrhea, which lead to rapid dehydration and, without treatment, death. 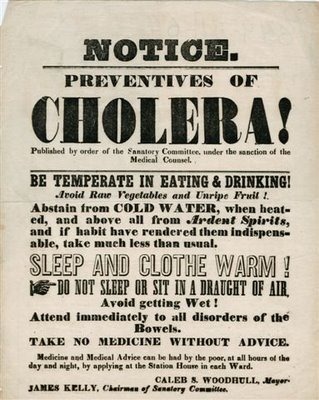 Cholera was probably the most terrifying of the diseases nineteenth-century Americans faced. It struck its victims without much warning. William McPheeters, a physician who treated patients during the 1849 St. Louis epidemic, wrote that the symptoms were "vomiting freely with frequent and copious discharges from the bowels; at first of slight bilious character, but it soon became pure 'rice water'; cramps in the stomach and lower extremeties and tongue cold; skin of a blue color and very much corrugated; urinary secretions suspended; eyes sunken and surrounded by a livid hue." Some histories claim that India is where cholera, sometimes referred to as Asiatic cholera, first assumed epidemic form, in 1817. 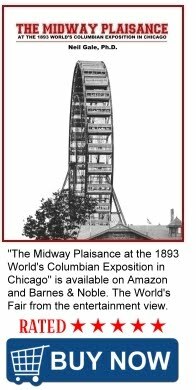 It is believed to have first arrived in America in 1832 and again in 1833, 1834, 1848, 1849, 1850, 1851, 1852, 1854, 1855, and 1873, when it made its final appearance in North America. The 1833 Illinois outbreak actually began in the summer of 1832 when federal soldiers from the east were recruited to help fight the Black Hawk War. That spring the disease, carried by Irish immigrants, broke out in Quebec and slowly made its way to New York City. Troops passing through the northeast were infected and brought the disease with them as they traveled the Great Lakes corridor to Fort Dearborn (Chicago). By the time they arrived the Indian war was over but the pestilence proved a much more formidable and deadly foe. Once in Illinois, the disease moved down the Mississippi Valley. The Illinois Patriot, Jacksonville weekly newspaper, reported on cholera attacks in several Illinois towns, including Quincy, Carrollton, and Galena, and attempted to allay the fears of local residents. Following the deaths of Mrs. Ellis and her children on July 19 and 20, James G. Edwards, owner, editor and publisher of the Patriot, tried to calm his readers. "Every requisite attention has been paid to the sick," Edwards wrote. "We hope our country friends will not place dependence on any exaggerated statements they may hear, concerning the ravages of the disease in this place, as the effects may be very injurious. Our accounts, thus far, may be depended on; and, should we be spared, we shall continue to give correct intelligence in regard to this subject." The "intelligence" the Patriot had shared up to that point was that 10 people had died in Jacksonville in the previous three weeks. The first local cholera death, the Patriot reported, was a man named John Barber, a miller from the now extinct town of Middletown Mills near Exeter in Morgan (now Scott) County, who had been brought to Jacksonville. Estimates vary greatly, but Edwards' published figures for Jacksonville's population and the number afflicted with cholera probably are the most reliable. On August 10, 1833, Edwards wrote that, according to Jacksonville physicians' estimates, from 200 to 300 people had contracted cholera in Jacksonville, out of a total population of 1,300. And of those 200 to 300 residents, 34 had died. Apparently many other residents, maybe as many as 600 or 700, fled Jacksonville to escape the cholera's grasp. Two weeks later, the Patriot updated its list of cholera casualties and brought some encouraging news. "The Cholera - No new case of this disease has occurred in Jacksonville since our last publication. There have, indeed, been two deaths by Cholera, since last Saturday morning, but they were of some days standing. We have now every inducement to believe that this destroyer of human life has taken its flight, at least for a season, from this place." On August 24, 1833, the number of cholera victims in Jacksonville stood at 47. Most histories of Jacksonville fixed the town's final toll from the disease at 55, but some accounts say as many as 100 people perished. The 1833 cholera outbreak also killed about 50 residents of Quincy and an estimated 33 people living in Carrollton, in nearby Greene County. No official record of the number of cholera deaths in Illinois is known to exist. Death records were not required by law until much later in the nineteenth century, and newspapers rarely ran obituaries in those days. Fortunately, Jacksonville and Morgan County histories recorded the efforts of two Jacksonville citizens who risked their lives to come to the aid of stricken neighbors, and also helped to bury those people they could not save. Cabinetmakers John Henry and James Anderson both helped nurse the sick and prepared the dead for burial. Henry later wrote: "I was in every house where there was a death. I took fifty-three myself to burying ground and had them buried in a plain, raised lid cherry coffin." Anderson added: "When a person died the measure of the body was sent us and we made the coffin out of cherry wood and lined it with domestic, but it was very seldom that any attempt at any ornamentation was made." Henry and Anderson became revered citizens for their valiant efforts during the crisis. By their actions, they showed they had a strong sense of community responsibility and selflessness. Henry's leadership abilities carried him to service in the Illinois House of Representatives, the Illinois Senate, and to Congress. Anderson remained in Jacksonville, and continued to serve the community as a highly skilled cabinetmaker and undertaker until his death at age 88 in 1899. The kindness shown by Henry and Anderson are even more remarkable when compared to the cholera account penned by Truman Post, another Illinois College professor at the time. "The distress of the town was extreme. Society was not then knit together by acquaintance and mutual kindness. The people, gathered from all quarters, had not coalescence enough for mutual helpfulness. The wild, vague terror of a disease, regarded as contagious and killing with fearful rapidity, kept men aloof from each other. Families were isolated in mutual quarantine, and doors and windows were seen by one passing along the streets, thronged with pale and tearful faces, sometimes with the sick, who had no one to minister a cup of cold water ... Human society almost disintegrated by mutual fear ..."
Perhaps the most vivid contemporary account of the Jacksonville cholera epidemic was recorded by Professor Turner, who had come to Illinois College just a few months earlier to teach Latin and Greek. A healthy doctor probably couldn't have helped anyway. The medical world in 1833 had little idea what caused cholera and therefore wasn't quite sure how to treat it. One physician who studied the Jacksonville epidemic was Dr. Anson G. Henry of Springfield, and he put forth some unusual theories about how the disease was spread. He visited Jacksonville in August 1833 and wrote back to the Sangamo Journal, the weekly newspaper in Springfield, that he was "satisfied that moral causes (had) more to do in spreading cholera than physical (causes). Dr. Henry also criticized the people who ran from the disease, writing that "those who have been constantly exposed to its influence by their acts of humanity, have almost invariably escaped." In a rebuttal sent to the Journal, an unknown Jacksonville resident challenged Dr. Henry's claim that the moral climate of Jacksonville spread the disease. The person acknowledged that while psychological factors could cause some diseases, only physical factors were at work in Jacksonville. "The timid and the bold, the temperate and the intemperate, the moral and the vicious none, can claim exemption from this liability." Some people, including many doctors, believed at the time that cholera somehow originated from the decomposition of animals or vegetables and was transmitted through the air. To prevent the disease, doctors recommended that decaying food be removed and that lime be thrown into privy pits and sewers once or twice a week. Among the "medicines" doctors prescribed for treating cholera were calomel pills, a powder used for intestinal worms; laudanum, a solution of opium in alcohol; powdered rhubarb; hot tea of sage, balm or thorough-wort; brandy in warm water; and teaspoonful of pulverized charcoal mixed with brandy. Professor Turner, in fact, wrote that he administered laudanum, tincture of red pepper in alcohol, and brandy to a very sick Illinois College student. The young professor said that he doubled and even quadrupled the doses he gave the student. "I will either kill or cure him at once," wrote Turner, who eventually cured the student of his cholera ailments. One of the nearly five dozen Jacksonville residents who couldn't be saved was a seven-year-old boy named Alexander Carson, the son of Thomas and Catharine Carson and the first male child born in Jacksonville. The Jacksonville cholera epidemic of 1833 lasted more than eight weeks, but its tragic consequences, according to historian Don H. Doyle, left a long-lasting mark on the community, leaving it with a reputation for being "sickly" and possibly costing it a chance at landing the state capital.